Can processed and red meat cause cancer? For most of us, meat is a regular part of our diet, and this is likely to include some red or processed meat. You may have some firm favourites – like a bacon sandwich on a Sunday morning or a lamb curry on a Friday night. But if you’ve seen news stories about potential links between meat and cancer, or campaigns around eating less meat, you may be wondering what’s true. So is it time to ditch the roast beef, bacon and sausages? We’ve got the facts and some tasty recipes courtesy of Paul McCartney’s Meat Free Monday campaign for you to try. What's the difference between red and processed meat? Red meat refers to certain natural meats that haven’t been processed in any way. It includes beef, lamb, pork, veal, goat and mutton. Processed meats on the other hand, are meats that have been altered, either to preserve them or to affect the way they taste. For example, salted, cured, or smoked meats – think bacon, sausages, chorizo, ham, salami and pâté. What’s the link between red meat, processed meat and cancer? Research has shown that you may be more likely to develop cancer if you eat a lot of red meat, although the evidence isn’t completely clear. For processed meat the evidence is more certain. If you’re eating too much processed meat you’re more likely to develop cancer, particularly bowel cancer. In the UK, it’s thought that about one in five cases of bowel cancer are linked to eating these meats. Unfortunately, the exact reason why red and processed meats can cause cancer isn’t fully understood yet. One theory is that a chemical called haem, which makes meat red in colour, could be the cause. Another theory is that chemical compounds develop when you cook red meat or process it. These damage our cells, which could cause cancer. In small amounts, red meat can be part of a healthy diet. It gives us protein and important vitamins and minerals, such as vitamin B, iron and zinc. But it’s important not to eat too much. It’s recommended that adults shouldn’t eat more than 70g of red or processed meat a day. Many of us, particularly men, are eating far more than this. If you’re eating more red or processed meat than you should, you can cut down but still enjoy it in moderation. Why not try the following tips. Keep some days each week totally meat free. You can use eggs, cheese, fish or vegetables instead. Try an omelette or fritatta, a vegetable curry, macaroni cheese or a fish pie. Eat white meats, such as chicken instead of red meat. Swap beef mince for turkey mince or for vegetable protein (such as Quorn). Use red lentils, beans, chickpeas and more vegetables in recipes like stews, chillis and Bolognese. Choose smaller portions of red meat when you’re shopping and eating. Using paprika instead of chorizo to flavour dishes, and use spicy chicken or jalapeños instead of pepperoni on a pizza. It’s worth remembering that cutting down on red and processed meat has other benefits too. It can cut down on your food bills. You’ll probably eat more healthy foods such as vegetables, beans and lentils. You’ll be eating less fat, and saturated fat. You’ll be eating less salt if you’re having less processed meat. The good news is you can still enjoy small amounts of meat as part of a healthy, balanced diet. So now is a great time to look at what meat you’re eating, and how much you’re having. 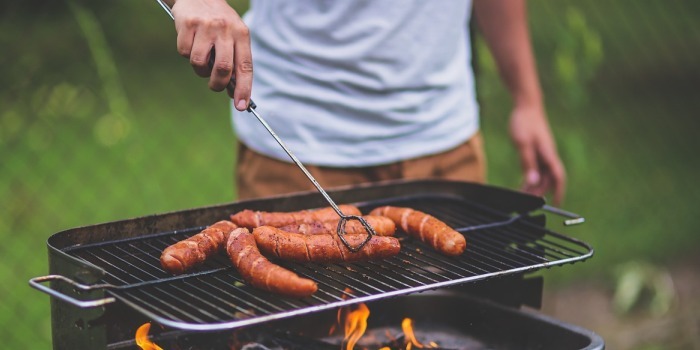 By making a few small changes, you can still get the benefits and enjoyment of eating meat, while at the same time reducing your risk of cancer. And just in case you need some inspiration to get cooking, here are some meat-free recipes courtesy of the Meat Free Monday campaign for you to try at home. Don’t be fooled by the name — the character of this thick, wholesome soup is more North African than Italian. It has a lot in common with the European version though, with the couscous playing a similar role to the vermicelli noodles found in many recipes. Rinse the farro in a sieve under cold running water, tip into a bowl, cover with cold water and soak for 20 minutes while you prepare the soup base. Heat the olive oil in a large saucepan. Add the chopped veggies and cook over a low-medium heat for 10–15 minutes until tender but not coloured. Add the crushed garlic and chilli flakes and cook for a further minute. Pour the tomatoes into the pan, add the stock and bring to the boil. Drain the farro and add to the pan. Reduce the heat to a gentle simmer, cover and cook the soup for 25 minutes until the vegetables are tender and the farro is cooked. Add the cannellini beans and cook for a further 2–3 minutes. You may need to add extra stock if the soup is too thick. Add the cavolo nero and cook for 3–4 minutes until tender. Season to taste with salt and freshly ground black pepper. 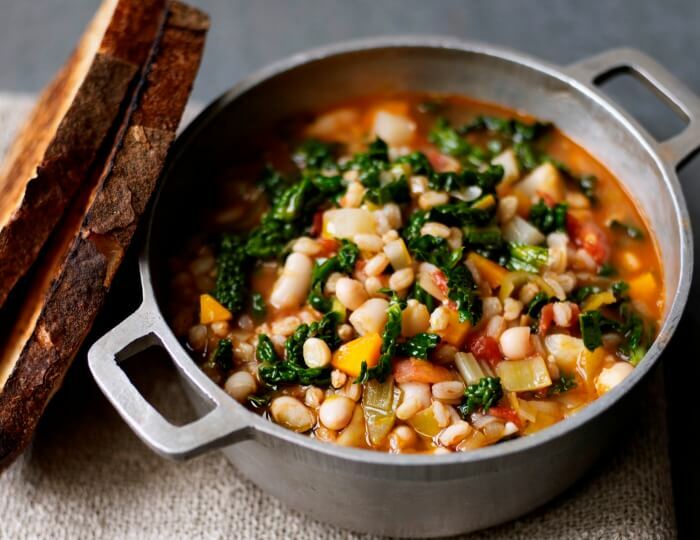 Serve in bowls with a drizzle of olive oil, a scattering of grated Parmesan and slices of toasted sourdough bread. Place 75g stoned dates, 75g dried apricots, 50g seedless raisins and 2 tablespoons apple juice in a food-processor or blender and work together until smooth, scraping down the sides as necessary. 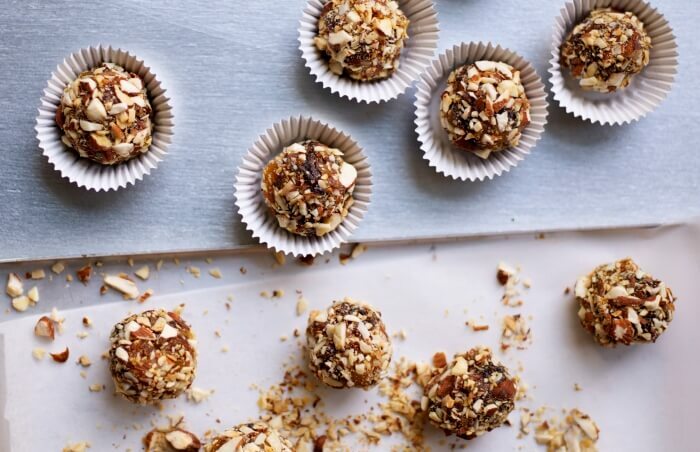 Form the mixture into balls the size of a cherry, then roll them in 50g chopped and browned almonds until completely coated.. Recipes taken from The Meat Free Monday Cookbook. Foreword by Paul, Stella and Mary McCartney. Published by Kyle Books. Photography by Tara Fisher.